I’m not an auto racing or car guy at all, although I do have fond memories of watching the Indy 500 (which is today) as a child (back then, it was on delay, not live), and I’ve always tried to catch the race whenever possible. In the past, I’ve had guest writers break down the race and cars, as well as provide some great history of the race itself (those were all penned by Rob Caplette, who posts on UW as “Inkracer”). If you’re looking for a history of the sport and the race, those are some wonderful historical breakdowns, and well worth a read if you have the time. So rather than repeat all that’s great about the race and the track (which I actually visited back in around 1991, actually taking a lap around the brickyard), I’ll just leave those articles for reference. Today I’m joined by another racing enthusiast, Clark Ruhland, who will do this year’s honors of breaking down the liveries for the 2015 Indy 500. Welcome to the greatest day of auto racing in the world ”“ The trifecta of the Formula 1 Monaco Grand Prix, the IndyCar Indianapolis 500 and NASCAR’s Coca-Cola 600. This year marks the 99th installment the 500 features 33 teams with some interesting paint schemes. The 2008 Indy 500 winner captured the pole with a 4-lap average of 226.760 MPH. The Target car is a staple of the IndyCar circuit and has won several 500s with different drivers. Power is the reigning series champion and has returned the tradition of carrying the number 1 after winning the title. His usual number is 12. Pagenaud joins Team Penske and has a legitimate chance to win the 500. Penske has won at Indianapolis a record 15 times. The 2013 Indy 500 champ is a fan favorite from Brazil and will no doubt be fired up after finishing 26th in last year’s event. Helio is another fan favorite from Brazil that has won the 500 three times. He’s looking to join the elusive 4-timer club that features AJ Foyt, Rick Mears and Al Unser. Wilson joins Andretti Autosport after several years with Dale Coyne Racing. He’s one of the taller drivers in the circuit at 6’4”. Bourdais wins the award for most interesting paint scheme with the monster-style nose design with the eyes and nose. Very cool look with the black and green. The third-generation Andretti makes another attempt at winning the 500. Last year he was in car number 25, but he’s changed to 27 for this year. Newgarden could not have a better number for sponsorship with Century 21 on the side. Hildebrand was one corner away from winning the 500 in 2001. Pretty interesting with Ocean Spray as a sponsor. Munoz may not be a flashy name, but he has two top-five finishes in his Indy 500 starts, including a second place in 2013. Carpenter is starting a little further back than the previous few years when he started on the pole back-to-back years. He has one of the more noticeable sponsors with Fuzzy Zoeller’s vodka on the side. Indy 500 history enthusiasts (like team owner David Letterman) love the school bus yellow 32 car designed to replicate the winner of the first Indy 500 from 1911 ”“ the Marmon Wasp. Kimball is a diabetic driver and has been a spokesman for the cause. His two-tone car designs always stand out on the track. The 2000 Indy 500 winner won the race as a rookie and returned last season after spending years on the NASCAR circuit. He may be starting mid-pack, but he’ll make his way to the front. The defending Indy 500 champion returns with the same sponsor and the same look in 2015. His car is one of the easier ones to spot on raceday. The son of 1986 Indy 500 winner Bobby Rahal (who co-owns the car with David Letterman), Graham is one of the favorite drivers on raceday in Indianapolis. He hasn’t had much luck, with only one top-10 finish in seven tries. His sponsor, Steak ”˜n Shake is one of the more unique ones on the circuit and his apron style firesuit wins the award for the best of 2015. Huertas finished 17th as a rookie last year, but did pick up a victory on the circuit last year. Unfortunately he still hasn’t picked up a sponsor this season. Simona is one of two ladies in the field today and she’s a veteran of the event. That’s a bit of a surprise for any driver from Switzerland, where auto racing is banned. Jakes is another one of those drivers in need of a sponsor today. His car could be tough to spot with that solid gray look. Wasn’t real sure what Alfe was when I saw this car for the first time. It’s a metal heat treating company. Pretty sleek and old school design based on Dan Gurney’s car from the late 1960’s. The young driver is in his second Indy 500. Last year he has not even graduated from high school when he ran the event. An Indianapolis native, Daly is running his second 500 in a car that has a similar look to his No. 43 counterpart in NASCAR. Bell is paying homage to 4-time Brickyard 400 winner Jeff Gordon with the stylized 24 on his car. Gordon, who is retiring from full-time competition in NASCAR, will be driving the pace car before the race. Sato drives one of the AJ Foyt-owned cars and is a big risk-taker when it comes to the 500. He made a last ditch effort to win the 2012 event on the last lap. Mann is the other lady in the field today ”“ Her third start in the 500. During the season, she is a pit reporter for the IndyCar radio broadcasts. Chaves is one of two rookies in the field this year. He’s no rookie when it comes to the speedway as he is the defending champion of the Indy Lights series Freedom 100. Saavedra has only run two of the 6 races this season after running every race in 2013 and 2014. A good run could go a long way for his hopes to continue this year. Hawksworth is driving another AJ Foyt car and it’s pretty much identical to the 14 of Sato. No idea how we’ll be able to tell them apart from a distance. Coletti is the other rookie in the field. He and James Jakes will be tough to tell apart on the track with that solid gray design. Clauson will drive anything with four wheels. He’s driven winged sprint cars on dirt, tiny asphalt midget cars, stock cars and now Indy cars. Last season, the car that started in this spot finished ninth, so there is hope for a good day. Briscoe replaces James Hinchcliffe after his nasty wreck last week that sent him to the hospital. Briscoe’s wife, Nicole, is an anchor on SportsCenter. Davison is a late addition to the field after Tristan Vautier qualified his car last weekend. He’ll drop to the rear of the field for the start. Sit back and enjoy a day of racing. It’s the best day in the world for it. Coverage from Monaco begins at 8 a.m. on NBC, Indy coverage is at 11 a.m. on ABC and Charlotte starts at 5:30 p.m. I check your site daily and submit ticker items from time to time, but I think this is my first concept submission. I wanted to create a modern, interchangeable set for my alma mater, Virginia Tech, using Nike’s newest Mach Speed template. I also made a BFBS set, as Tech’s original colors were black and grey, and our black pro combat jerseys from 2010 are still talked about among the fan base. Hi Phil, nice piece about the Chicago Fire helmets, I thought they were by far the best looking helmets in the WFL and as I mentioned before I saw every team in person except the Americans. The Detroit Wheels also had great helmets but their uniform was just OK. I remember thinking the Fire had better uniforms than most of the NFL teams. Here is a picture of my father playing against the Fire in 1974, this was one of the better WFL games. The King’s old Pottstown Firebird WR Jack Dolbin caught the winning TD for the Fire, the King led the Bell back as time was running out and Mike Carter dropped a pass in the end zone that would have won it for the Bell, Ron Waller was so furious he cut Carter the next day. When the Fire came to Philadelphia I remember a Fire WR landing right in front of me after a catch and getting the wind knocked out of him, I was looking at the size of that flame on his helmet as he was groaning, he rolled over and our eyes met and he was like “who the hell is this kid?” Then the Fire trainers ran over and told me to beat it. NBA/Basketball News: Here’s another angle of the new Kentucky Wildcats logo at Memorial Coliseum (h/t Jason Calvert). … Josh Smith has the Atlanta Hawks pacman logo tattoo (nice spot by Jedd Skiles). … Check out the AWESOME floral print uniforms worn by the 1973-74 U of Hawaii Basketball squad (from PressRoomGFS). 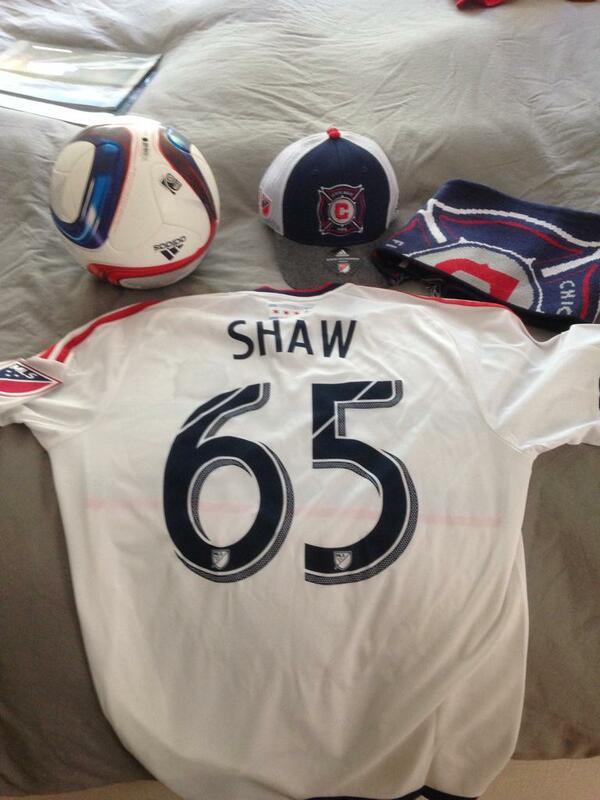 Hockey News: Here’s another Cross-sport support: The Chicago Fire sent Blackhawks’ Andrew Shaw a jersey after his disallowed header in game 2 (h/t Michael Bochum). Here is a bit more on that (thanks, Mike). Soccer News: Barcelona unveiled a special jersey to bid farewell to legend Xavi. The words “6racies Xavi” will be emblazoned beside the crest. … Here’s a full view of the 2015-16 Barcelona home kit (from Conrad Burry). Grab Bag: At the conclusion of the AFL match between Geelong and Carlton on Friday, Geelong player Cameron Guthrie and Carlton Player Chris Judd swapped jumpers (nice catch by Graham Clayton). … Here is what Roger Federer will be wearing at Wimbledon this year (via Andy Whitman). … Check out the patches the teams are wearing for the 2015 Men’s Lacrosse Championships (h/t The Emblem Source). And that’s all for today folks. Thanks to Clark for the Indy 500 rundown and the concepters and Jimmy. Enjoy the race (or whatever you’ll be doing and watching today — especially baseball because you might not want to watch the camo show on Monday). You guys have a great week and I’ll catch you next weekend. I really like the VT Hokie concepts and the Hawks would be a major improvement over their generic looking Red, White and Blue current uni-set. quick question: if were to say which team in each of the big 4 sports represents RED more than any other team in their respective league, is it the following 4? Trolling aside, I’d probably go with the Bulls over the Rockets. Chicago hasn’t really changed much in decades while the Rockets can’t really decide on what they are. They’re rather red now, but they’ve also been blue. You know, until they started wearing that pointless black alternate, I might have gone with the Cardinals over the Chiefs. Yeah, I know that they had an awkward blue period in the ’30s and ’40s, but at least during pro football’s “modern era,” they were arguably the NFL’s quintessential red team for quite a long time. And trolling isn’t a side…it’s the main course! Maybe because I grew up in the 80’s/90’s and watched the MJ in red, but that one is a no brainer for me. I would agree with Bulls but they do too much Bfbs for my liking. Also, aren’t the Angels unis redder than the Reds? A. It’s not really BFBS when black is your other main team color. B. You can’t be redder than the Reds. They’re the Reds. They define what red is. If the Reds are wearing green, then green becomes a new shade of red. Anything that you think is more red than the Reds is just an illusion. But if you have a main color other than red, can you really be the reddest team out there? I’d say Chicago uses black as an accent/alternate more than Houston uses yellow or anything, so I’d go with the Rockets as the redder team. Just wanted to give a heads up (and I know how difficult getting accurate images can be having done this article for you guys in the past) Justin Wilson will actually be in a red and Black Rolling Stones sponsored car for today. Also of note, Servia will be carrying decals for co-owner Dave Letterman’s final show as Late Show host. I miss the cars from my youth (born in 72). The cars today look like Ridell Revo Speed helmets. I know. I know. Get with times. I’m with you. Just a cleanness of line and purposeful function for form. PS I’m a touch older than you (no numbers, please) and I don’t even try telling my nephews that Tape Delay was a great thing because there was no ESPN. I’m too young to have someone older than high-school age look at me and hear Quarters had bumblebees on ’em. Carlos Huertas has been replaced as the 18’s driver due to an inner ear condition. Tristan Vautier will be driving ng the car in his place. @BWilliams – other than the BFBS set, I also really like the VT set. More than I thought I would. When I think red in the NBA, I think Bulls, not Rockets. As a Bulls fan, I think of them first as well. But in light of the fact that they have black alternates (and wear them a fairly significant number of times), I can understand why someone else would choose another team. There has been an increasing amount of cross team support in DC, especially between the red, white and blue teams. Nats and Wiz at Caps games, Wizards had a post-season outing to Nationals Park, etc. Some of the burgundy & gold fans are feeling threatened. It’s amazing how much they have alienated themselves from the area. Still #1 team by far, but the growing indifference is hard to comprehend. No it isn’t. Years of ineptitude, an owner whose photograph serves as the dictionary definition of “arrogant” and the desire to squeeze every penny possible out of the fans will do that for you. Did want to point out that the ban on racing in Switzerland has been lifted…sortof. I think it is only legal with certain environment pieces in place. Gene is correct, the picture is from when the Bell played at Chicago. I used this picture because it was a good shot of the Fire helmet, I did not attend this game. I do not have a picture from when the Fire came to Philadelphia and I saw the Fire WR get hurt in front of me. And the King literally flipped out when Chicago had to forfeit the last game in 1974. The King still had a chance to pass Tony Adams as the WFL’s leading passer, since the King called his own plays they were almost all going to be passes and Chicago’s defense was pretty bad at the end of that season. He still ended up leading the WFL in TD passes but Adams was the WFL’s leading passer. Was Cameron Guthrie wearing a “Manzear” during the match? Boston, particularly the Red Sox, always does a great job of this. During NBA/NHL playoffs, you’ll see the Celtics/Bruins logos painted on the backstop at Fenway. They also update the Green Monster when the other Boston teams win, and if one of the other teams wins a title, they’ll bring them in for a ceremony/first pitch. The white helmet is my favorite here, and should probably just be used for all four jerseys. The logo shows up best and the brown facemask contrasts well. I don’t really mind the black jersey, but it really needs to be paired with the white (or even orange) pants. Black-on-black just looks bush-league. The best thing about this design is that it’s one of the few that I’ve seen where a two-color contrasting yoke actually ends up looking decent. Nice job on those lines. Love the VT concepts. Send those out to the Athletic Department!! You gave that the Formula 1 race was on NBC and the Indy 500 was on ABC, but you said nothing about the Coca-Cola 600 being on Fox, today? Why is that? Wasn’t there a rundown of the livery at the Daytona 500 back in February? That’s the iconic race of NASCAR, as the Indy 500 and Monaco are for their series. Actually. I wasn’t referring to the livery, but where the race was being shown on TV. I believe those NCAA lax patches are same each year, just change colors depending on host cutie/stadium. At THE LINC…GREEN LETTERING. As a Navy veteran, though i did not serve during an actual conflict, the military tributes are being totally overdone. I think they started with good intentions but it seems as if they have just become ways to sell more merchandise. From my perspective, the fact the flag still flies and the national anthem is sung is enough. The tributes ring hollow these days. Send money to actually help vets in need instead.